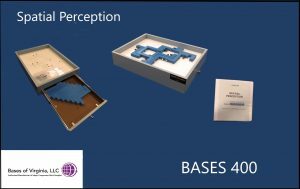 The BASES Spatial Perception Work Sample is a criterion referenced work sample and was developed to assess spatial perception, manual dexterity, finger dexterity, form perception as well as the ability to follow a diagram. The evaluee is instructed to place the blocks over the diagram identifying the unique placement for each block. The blocks are identical in shape, however each is different in that the holes are positioned differently on each block. There is only one position that is correct. After the blocks have been laid out the evaluee fastens them together with a bolt and stopper. The BASES Spatial Perception Work Sample also measures a variety of work behaviors and characteristics including attention to detail, frustration tolerance, personal complaints, work vitality and ability to maintain motivation. The work sample typically is administered in less than 30 minutes.